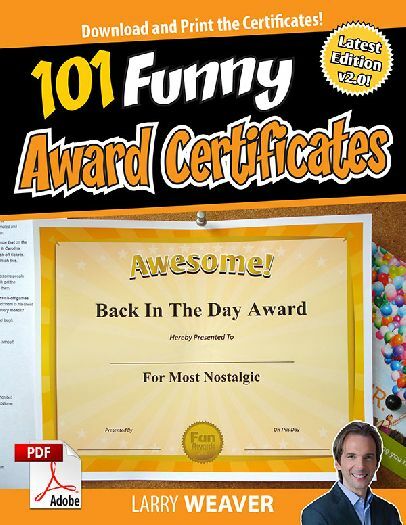 101 Printable Funny Award Certificates to give family, friends, coworkers and teammates plus 6 Awards Templates for making up your own Funny Awards. Appropriate for everyone, no matter the audience or the type of group. "Funny Award Certificates" includes 101 printable funny award certificates with colorful designs packaged in a downloadable PDF file that works on a PC or Mac. As a bonus, you'll get 6 blank award templates for creating your own funny awards. You can type directly into the PDF or hand write to complete the awards. Print as many as you like on the paper of your choice. Designs are set to work on standard 8.5” x 11” paper. It’s simple and easy to do.